I received this email from the Cruz campaign. In case you can't read it here is what it said. Friend -- tomorrow is too late. I emailed you two days ago...but now the situation is serious. As of right now, I am still well short of my FEC mandated End-of-Quarter deadline by more than four-hundred thousand dollars. Our campaign -- Heidi and I -- need you to keep us in this race. In just a few short days, we have to come up with the difference or risk missing our EOQ deadline goal and letting you and the rest of our dedicated volunteers and campaign staff down. I've faced a lot of tough decisions in this campaign, and now, I need you to make a tough decision with me -- will you decide to contribute $35 or $50 towards my EMERGENCY EOQ fund? The next few hours will be make-or-break for my run for the presidency. So, I need to ask for your immediate financial support. This election has taken its toll, and we've come a long way -- but my biggest deadline is approaching, and I need your help BEFORE I come up short. After March 31st, our campaign must file financial reports with the Federal Election Commission (FEC) detailing contributions and expenditures. Once my report is made public, the liberal media will begin scouring every line looking for weakness. Please don't let that happen. 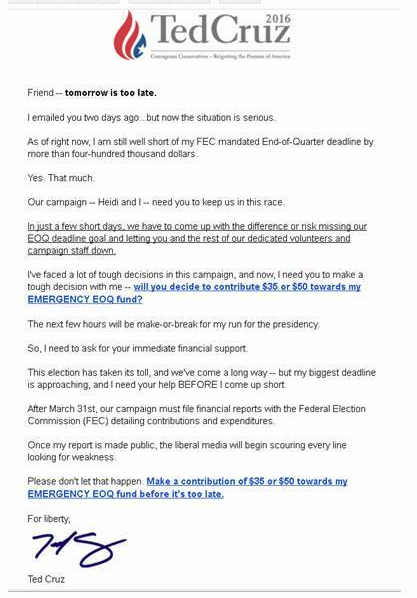 Make a contribution of $35 or $50 towards my EMERGENCY EOQ fund before it's too late.